The aim is to minimise roadside infrastructure, said Mr Darling. Here is the full text of Transport Secretary Alistair Darling's speech on plans for pay-as-you-go road charging. In our manifesto we said: "Because of the long term nature of transport planning we will seek political consensus in tackling congestion, including examining the potential of moving away from the current system of motoring taxation towards a national system of road pricing." Today I want to set out the challenges we face: why we need to examine whether road pricing could bring the benefits we need, and what we need to do now to achieve them. And because transport planning is by its very nature long term, trying to build a consensus is both desirable and necessary. We need that consensus because moving to road pricing - charging on the basis of distance travelled varied according to how congested a road is - would be a radical change from where we are now. Planning and delivery would span several Parliaments. And consensus amongst politicians is not enough. We need to learn the lessons from Europe over the last few weeks, and recognise the need to take the public with us. If you stopped 100 people in the street right now and asked them about national road pricing, I would be willing to bet that, until this week, most would say they hadn't ever given the issue much thought, never mind the benefits such a system might bring to them as motorists and to the country. And public support is important. If you can't persuade the public that there is "something in it for you", then we are unlikely to get off the starting blocks. So building a consensus is therefore important. Now it is important to remember what we are trying to do here. The prize is getting more out of the road network, therefore improving choice for drivers with more reliable journey times. The objective is to allow people and goods to move as efficiently as possible and at the same time meeting our environmental objectives. Climate change is a fundamental priority for this Government - as the PM has made clear for our Presidency of the G8 and EU. For any road pricing scheme developed, we would ensure that incentives for cleaner vehicles are safeguarded in order to contribute to meeting our targets on CO2 levels. Our objective is not to put people off the roads. It is to enable us to get more out of the network. The feasibility study which reported to me last year set out a range of charges from 2p a mile, through to £1.34 a mile on the busiest roads - and they said that the maximum charge would be paid by only half a percent of traffic. And the study also said that a national scheme has the potential to reduce urban congestion by nearly half. And the study said this could be achieved by more than half of the traffic paying less than would otherwise be paying in fuel taxes, and only a small proportion of traffic paying the highest charge levels. Now, it is true that there are big questions still to be answered on road pricing. That is because this is a radically different approach. No other country in the world has done this. But because of our geography, our growing economy, our demography, we will face increasing pressures on our roads over the next 20 to 30 years. So it is essential that we start to do work now that will help us to deal with this problem. Our future prosperity depends on it. We need to safeguard our environmental objectives. We need to respect privacy. We need to work out how the prices would be set. And we need to make sure that a system works at a reasonable cost, with clear benefit to road users, as well as the country as a whole. For those who would immediately balk at such a radical change as road pricing, think about the alternative. The prospect of a system becoming slowly but surely gridlocked, like you can see in many American cities every day of the year. What is certain is that the problem of congestion is going to get worse. Doing nothing is not an option. And the prize - giving motorists more choice and making journey times more reliable - is surely a prize worth having. First let me set out the challenges we face. 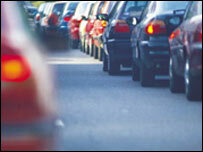 Congestion is a growing problem in all the major conurbations across the UK - and not just in the South East. We live on a crowded island. Reliability of journeys is becoming a growing problem, in the North West, the West Midlands, in the Scottish central belt, for example. And it is a complex problem because roads are not congested all of the time. It varies from place to place, and with time of day. It is a growing problem, and although it is important that we increase capacity on some roads, like the M1 and the M25, we cannot simply solve congestion by building more and more roads. There isn't the space to do it, especially in urban areas. And even if there was - it would be environmentally unacceptable. Too often UK Governments have had to spend their time fixing the problems of the past, instead of looking ahead to solve the problems we know we will face in the future. It is for Government to do what is necessary to plan ahead, but it is also essential that everybody is fully engaged - road users, businesses, councils. We will be doing what we can in the coming months to make sure all these important groups are engaged. Now looking ahead as the economy continues to grow and we get wealthier, the pressure on the existing road system will increase and congestion will only get worse. When we look at underlying trends the evidence must be a cause for concern. We already know that congestion will rise as both the economy grows and the population rises - but the number of households is also set to double in the next thirty years - which will have a significant impact on car use in the future. As we become more prosperous, the number of two car households will increase - and this means that the number of car journeys could go up and so will the distances we travel by car, as we become better off. People's attitudes to commuting have also changed significantly over time. The number of dual income households is increasing, and when one partner changes job they are less likely to move. And there are other reasons for not moving, like not wishing to disrupt their children's schooling - or house prices for example. All these factors have a big impact on congestion growth, and so will a continuing strong and stable economy - the price of economic success. And moving goods efficiently around the country will become more and more essential to maintaining our competitive edge in the global marketplace. That is why the Chancellor and I have asked Rod Eddington to look at what we need to do in transport in the future to maintain productivity, stability and growth in the UK. So the question is - what are we doing about congestion both in the short term - and importantly, what more we can do in the medium to long term. In the short term, we have already taken action. In the White Paper we published last July, we set out how we plan to combine sustained investment in the existing infrastructure and better management of the existing road network and to increase capacity where necessary to improve safety and reliability of journeys. We will continue to improve public transport - that's a given. In any overall package of measures to tackle congestion, improved public transport is absolutely essential. Indeed, since 1997 we have more than doubled spending on transport infrastructure, and invested substantially in public transport to provide greater choice. We will continue to do that, and indeed, we need to do more. But the problem won't be solved by improving public transport alone. It can never be enough on its own. We have increased investment in public transport - people made a billion journeys by rail in 2003 for the first time since the 1960s. We are increasing investment on strategic roads - around £2bn over the next three years. We are using new technology to better manage the roadspace, including piloting a new system of traffic management on the M42. Tackling congestion by using the latest technology in order to increase capacity during the times of day it is most needed. Last year I launched the West Midlands regional control centre and the first group of the Highway's Agency's new traffic officers, who get the traffic moving again after accidents and incidents. For local roads, the Traffic Management Act has given local authorities powers to keep traffic flowing and co-ordinate roadwork to minimise disruption. We will also introduce car pool lanes. These are all measures which in time will make a difference to traffic flow - steps in the right direction. But even with these measures, the trends are against us. That is why we need to see what more we can do. You know that we aim to introduce lorry road user charging on the basis of distance travelled. We need to start asking whether more general road pricing for all vehicles - with different charges on different roads at different times - could work. I want to set a framework for taking this debate forward. We need to be able to answer three key questions. First, what sort of system do we need and what sort of benefits would it bring. There are different forms national road pricing could take and we need to look at those options. Second, is the technology available and can we construct an affordable scheme that would work. Cost is important. Third, what practical steps do we need to take in the mean time. As I have made clear, road pricing is about charging according to distance and congestion. The benefits of this approach were outlined in the feasibility study on Road Pricing which reported to me last July. It estimated that a road pricing scheme could achieve a 40% reduction in congestion with only 4% less cars using the road. We then need to think about the equipment needed to calculate what a driver would pay, and what information gets to the people who will issue the bills. As well as significantly improving the reliability of people's journey times, this would also bring about real environmental benefits, and improvements in road safety. But how would we do this? What technology is available? What is right for the job? One of the options is to use positioning technology - satellites in other words, so that we minimise the amount of infrastructure we would have to build at the roadside. A lot of this technology is out there being used for commercial purposes - that is why the DfT will be doing more research here as well as talking with industry. One UK insurance company is currently piloting a brand new system of "pay as you drive" insurance, which uses a satellite box fitted in the car to calculate the cost of the insurance premium on a monthly basis. The benefit is an average reduction in the cost of insurance by about 30%. Instead of paying a yearly premium, the rate of insurance is calculated on a monthly basis and sent to the car user as an itemised bill which looks exactly like a mobile phone bill. Customers are aware of exactly how their insurance costs are calculated, and they are familiar with the billing format. The point is that in 10 years time this could be commonplace. And many cars are already fitted with technology which combines satellite positioning with mobile communications. It has a number of uses - from providing drivers with useful information on road conditions, to alerting rescue services automatically in the event of an accident. The question we need to ask ourselves is how we could use technology like this to deliver national road pricing that would work for the UK. And we need to do more work on how to design and build the systems we would need. I know that one area of concern is privacy. Let's be clear what we need is a system that will ensure the right price is put on the right journey - and that the motorist can see and understand that price - because that will influence the drivers' behaviour. I know that for pricing to be acceptable, people will need to have trust in the system and be comfortable with the way it runs. Making sure that the right technology is available to achieve this part of the work is being undertaken by my Department. And as I have already said, we need to respect privacy and make the system fair. This brings me to my third point. Moving to such a system could not happen overnight. It would need careful long term planning. And even if the technology was in place today, there are big issues that would need to be addressed before any final decisions could be taken. Let's face facts: as the Feasibility Study noted, implementing a national road pricing scheme would be a massive and complex task. Those who think it is just a question of the Government making brave choices need to think again. Large technology projects are always tough to get right. And if we do this, we will want value for money. And we will want the system to work. So there is a challenge for industry here as well. But we need to face up to the challenge. In last summer's White Paper we said that we would do the work necessary to enable us to make the decisions needed when the time came. Whatever we decide about national road pricing, there are problems that cannot wait for a national solution. We need to get on with these local schemes now. And I'm clear that we won't get to national road pricing all in one go. Nor should we. We will need tests and trials of the parts of the system. And we will need a pilot somewhere in the UK - probably in a major conurbation or region of the country. To do that we'll need to work with one or more local authorities. No decisions have been made about where they might be. But we need to be making those decisions in the next two years, with a pilot up and running in five to six years. Last year the Chancellor and I set up the Transport Innovation Fund to support innovative local and regional transport strategies as well as schemes which could make a real contribution to national productivity. As part of that, local authorities will be invited to come forward with innovative solutions to tackle congestion problems in their local area which will include demand management measures based on pricing. Such schemes could provide real benefits for local people. It is for local authorities to come forward now and work with us. Next month I will publish guidance on the system for allocating preliminary funding. But I can say that we are prepared to make money available through the Transport Innovation Fund to support these schemes, up to £200m a year specifically for these local areas. People say national road pricing is ten years away - and it always will be - unless we examine the options and decide what we want. Once we've decided, we can get on with doing it. We need to make progress on the local schemes, solving local problems. And we need to consider the national options and make the right decisions. So in summary, in the next few months these are some of the things the Government will be doing in the coming months. My Ministers and I will work to build a political consensus. I have asked to meet the shadow spokesmen for both the Conservatives and the Liberals to see if we can work together to deal with this problem. We want local authorities to come forward to bid for resources in the way I have described, and we will publish guidance next month. My Department will examine the detailed technical issues about how road pricing might be introduced, including discussions with industry about future developments. And we are asking everyone to help us to carry the debate forward and consider the choices before us. Road pricing is not an easy option. There will be hard choices and difficulties along the way. But we need to face up to all this now. Future generations will curse us if we fail to deal with the problems we will face very soon. And I think we owe it to them to begin to plan for the next 20 to 30 years instead of constantly trying to fix the problems of the past. We live in one of the largest economies in the world. We need a transport system that will allow us to continue to grow and compete across the world. To do that we need to plan ahead - and do that now. Congestion: to charge or not to charge?